Intralobar sequestration (ILS) associated with congenital cystic adenomatoid malformation (CCAM) is a well-known entity. This hybrid form has many considerations for an appropriate management. 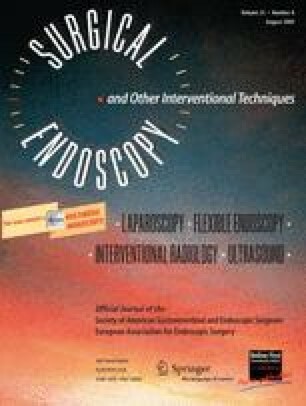 This report aims to analyze pitfalls in the diagnosis, treatment, and thoracoscopic procedure pertaining to this association. Between May 2004 and September 2007, 23 fetal lung lesions were diagnosed prenatally and managed at the authors’ institution. Seven of these lesions were the hybrid form of ILS-CCAM. The records for these lesions were reviewed retrospectively. In all seven fetuses, prenatal ultrasound diagnosed congenital lung abnormalities. In three cases, fetal magnetic resonance imaging (MRI) demonstrated a macrocystic lesion supplied by an aberrant vessel. In all cases, the intrauterine evolution remained uncomplicated. All the newborns were asymptomatic at birth. Chest computed tomography (CT) performed at the age of 1 month showed the aberrant vessel in five cases. A regression of the lesion was noted in one patient and that of the aberrant vessel in another patient. Elective thoracoscopic lobectomy of the affected lobe was performed for six patients. The average age at the time of intervention was 5 months. At this writing, one patient is under observation due to resolution of the lesion. The operating time ranged from 80 to 160 min. One conversion to thoracotomy was required. All surgically treated patients had an uneventful hospital course. Histopathologic examination confirmed the association of intralobar sequestration with Stocker type 2 CCAM in five cases and with CCAM type 1 in one case. Prenatal diagnosis of the ILS-CCAM association was possible, as was resolution of one or both components of this lesion. Preoperative identification of the aberrant vessel is important for prevention of operative morbidity. This should be controlled before the lobectomy is begun.